Sī Fáng Cài (lit. private house dishes) is a culinary tradition rooted in the home kitchen, which is where the cuisine actually evolved over thousands of years. Yet it is not the common, everyday food implied by the English phrase “home cooking”—rather, Sī Fáng Cài connotes the exceptional, high-end fare produced in households devoted to serious cuisine, sometimes over generations. Chinese history is full of gentlemen gastronomes, lettered men of means who adored food, wrote about food, kept the best chefs they could find in their kitchens, and hosted lavish banquets. Though the actual food was usually prepared by their chefs (or their wives! ), these great gourmets were powerful agents of culinary culture; they insisted on excellence in food, immortalized it in their writing, and sometimes, like Yuan Mei, even left behind cookbooks. Thus the association of exceptional cuisine with a particular household name was a longstanding pattern in the foodie landscape. The most famous 20th Century “dynasty” in private family cuisine is that of the Tan family.Originally from Guangdong Province, raised on Cantonese cuisine, patriarch Tan Zongjun scored a high mark in the imperial examinations at age 27, in the Qing Dynasty’s fin de siècle twilight, landing a plum position in Beijing. He threw himself into the foodie high life, hosting, procuring expensive ingredients, and astonishing his dinner guests with masterful creations. Apparently it was his wife, Madame Tan, who was the genius in the kitchen, and her cooking earned their initial fame. But Tan Zongjun made enemies, and ultimately had to retire early, returning home to Guangdong. Years later, in the final days of the Forbidden City, his son Tan Zhuanqing returned to Beijing and cooked for the imperial family, making his name as a great chef. Because of his time in the palace kitchens, Tan family cuisine is considered guānfŭ cài, 官府, officials’ cuisine, as well as private home cuisine. Retaining a basic affiliation to Cantonese food, Tan family cuisine brought in influences from Shandong Province (an important root of Beijing cuisine) and Huaiyang cooking (a popular and highly cultivated sub-style of Jiangsu Province). The fall of the Dynasty in 1911 put the younger Tan out of the Forbidden City, but he took a civil service post, and spent the next decades in Beijing becoming even more famous than his father, sparing no expense to orchestrate incredible food experiences for himself and his friends. His name became synonymous with high-end gastronomy in Beijing. Beset by financial problems in the 1930s, the Tan family opened a restaurant in their home, which became quite successful. They only accepted reservations from friends, or friends of friends, and since everyone knew of Tan Zhuanqing’s obsession with delicacies, they were mobbed. 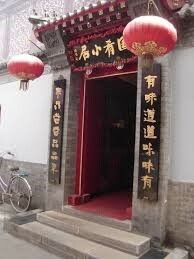 The restaurant would keep going, in their home, until most of China’s private restaurants were shut down in the 1950s. The Tan family’s success illuminates the modern form of Private Home Cuisine, still with us today: the Private Home Restaurant. Peng Changhai learned to cook as a menial underling in the Tans’ private home restaurant. After mastering 200 of the Tan family recipes, he took over from Tan Zhuanqing’s third wife, and was recognized as a great chef in the Tan tradition. By the time he came of age though, individual enterprise was no longer permitted, and having his own private home restaurant was impossible. In 1958, a solution appeared: Premier Zhou Enlai, who worked to preserve traditional arts and architecture, arranged for Peng to join the staff at the Beijing Hotel, on the grounds that a chef of his caliber was needed to prepare banquets for guests of state. Though certainly not open to the public in that era, Peng’s kitchen in the Beijing Hotel was said to have offered some of the most exquisite food then available in China. Moreover, because he had chefs working under him, and was himself an heir to Tan Zhuanqing’s cuisine, Peng’s stint at the Beijing Hotel ensured that the Tan cooking tradition was never interrupted. The Tans’ was one private home cuisine that survived the cultural upheavals of China’s mid-20th Century intact, and is still offered today in specialty restaurants in Beijing. In the 1980s and 90s, one of China’s most famous private home cuisines was that of Beijing’s Li family. Descended from a food-crazy patriarch who had retired in 1909 as Commander of the Imperial Palace Guard, the family collected and cherished recipes he had memorized while watching over the Forbidden City kitchens. When their trove of recipes was destroyed in the Cultural Revolution, they sat down together and recreated them. Finally, in the 1980s, after one of the daughters won a national cooking competition, they opened a private home restaurant, in which they combined remarkable food with the cachet of a resurrected imperial menu. A dinner seat in their house became the hottest ticket in town, and was booked out weeks in advance—much like the Tan family operation of the 1930s. Now that China is once again a vast sea of individual enterprise, anyone can open a restaurant serving private home cuisine, and these have appeared in the big cities. While it may take a little research to separate the real finds among private family cuisines from the inevitable wannabes, these restaurants can be infinitely worth checking out. Aside from the interest of eating in a small, intimate space—maybe even a private home—the food at private family cuisine restaurants is often far superior to standard restaurant fare.